This American saint was born in Bohemia in 1811. He was looking forward to being ordained in 1835 when the bishop decided there would be no more ordinations. John wrote to bishops all over Europe but the story was the same everywhere no one wanted any more priests. John was sure he was called to be a priest but all the doors to follow that vocation seemed to close in his face. John was appointed bishop of Philadelphia in 1852. As bishop, he was the first to organize a diocesan Catholic school system. A founder of Catholic education in this country, he increased the number of Catholic schools in his diocese from two to 100. John died on January 5, 1860 at the age of 48. 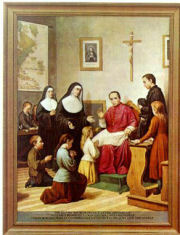 Saint John Neumann, you helped organize Catholic education in the United States. Please watch over all Catholic schools and help them be a model of Christianity in their actions as well as their words. Amen.